Our largest program, Rebuilding Day, occurs twice a year - once in April and once in October. On these days, over 1000 volunteers come together to serve 30+ low-income homeowners and nonprofit facilities throughout Santa Clara County. The impact is widespread and life-changing! As we focus on serving seniors and individuals with disabilities, we provide many safety modifications, like grab bars, steps, handrails, ramps, and lifts. We also paint the interior/exterior of buildings, repair skirting, siding, roofs, water heaters, and furnaces. 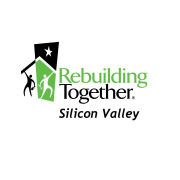 If you are interested in contributing in any way to our organization and our programs, please email info@rebuildingtogethersv.org or call (408) 578-9519. Would you recommend Rebuilding Together Silicon Valley?